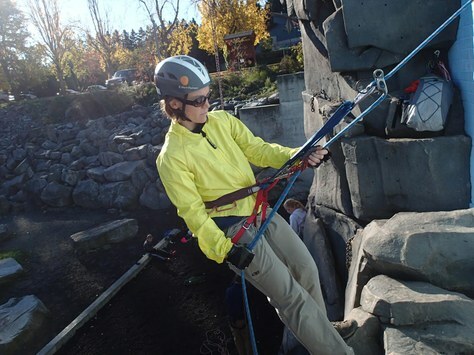 Seattle Climbing adopts new extended rappel and belay techniques in basic and intermediate courses. The Mountaineers strives to be a leader in outdoor education. This means ensuring that our courses are teaching the safest techniques and the instructors and participants are aware of the latest technology in each of the outdoor skills we teach. One of the ways that we stay up to date is encouraging our volunteer leaders participate in advanced leadership and education programs outside of our organization to bring back what they’ve learned and share it with our community. This information and the order in which it is presented is intended to provide an overall understanding of these techniques; they are not intended to serve as a tutorial on how to rappel or engage in any other climbing activity outside of the context of a complete climbing course. Rappelling requires the ability to make decisions on a situational basis, and the extended rappel might not always be the best setup for a given circumstance. Furthermore, this information includes specific gear recommendations for this setup. Any adjustments made to this setup should be made by someone with further training, experience, and an understanding of the risks involved! Safer: the position of the autoblock keeps rappel lines in ideal braking position. Smoother: the distance between the rappel device and the autoblock enables cleaner descent. Snag free: the autoblock and clothing are high and clear of the rappel device. Easier to manage group and gear: extension enables more than one individual to setup on the rappel—especially important if the instructor has to rappel first; sides are now free for saddlebags or for switching brake hands. 1. Tie back long hair. 2. Keep the rappel device in reach. 3. This is not intended for use with a Munter rappel. Dyneema, when used as a PAS, presents a greater risk of injury in a factor 2 fall. Tie an overhand or a figure-8 knot at the midpoint of the sling. Adjust to enable equalization. 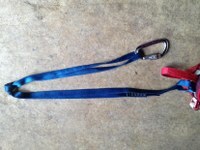 Position the carabiner used with your rappel device so that it is clipped through the two legs of the sling. 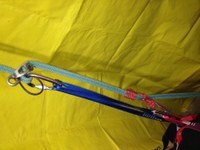 This will create redundancy once the sling is clipped back to the belay loop (see Step 4). 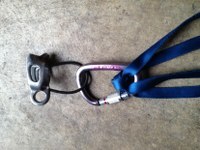 Use a second locking carabiner to clip the end of the sling into the rappel anchor to safely secure yourself to the anchor while you set up the rappel. Once the rappel is setup, then test the rappel with the sling still clipped into the anchor (see above). If and when using Dyneema, the same setup applies, but be especially careful about letting your personal anchor develop slack, especially if you find yourself above the anchor. 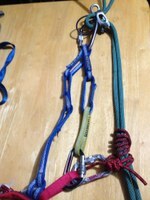 If and when using a Personal Anchor System, such as the Metolious PAS pictured here, be sure to clip through two of the sewn loops to ensure redundancy (see photo below). One of the main advantages of this setup is the ease with which it allows you to use the autoblock. It’s worth the time and few extra dollars to figure out the appropriate length and material that works best for you and the ropes you typically climb with. Many climbers have multiple autoblocks and they decide which to use depending on the day. Martin, Jason. “Extending Your Rappel. American Alpine Institute—Climbing Blog. October 10, 2014. Web. Gaines, Bob and Jason Martin. Rock Climbing: The AMGA Single-Pitch Manual. Falcon Guides: Guilford, CT. 2014. Print. Practice, practice, practice! Keep those skills fresh...and safe!